Old Bridge Township is a township in Middlesex County, New Jersey, United States. As of the 2010 United States Census, the township had a total population of 65,375, reflecting an increase of 4,919 (+8.1%) from the 60,456 counted in the 2000 Census, which had in turn increased by 3,981 (+7.0%) from the 56,475 counted in the 1990 Census. As of the 2010 Census, the township was the state's 18th largest municipality, after being the state's 21st most-populous municipality in 2000. Old Bridge is a bedroom suburb of New York City located across the Raritan Bay from Staten Island, and it is about 25 miles (40 km) from Manhattan, and about 30 miles (48 km) south of Newark. What is now Old Bridge Township was originally incorporated as Madison Township by an act of the New Jersey Legislature on March 2, 1869, from portions of South Amboy Township (now City of South Amboy). In a referendum held on November 5, 1975, voters approved changing the township's name to Old Bridge Township by a margin of 7,150 votes to 4,888. The township's name was changed to avoid confusion with the borough of Madison in Morris County. Use of the name Old Bridge for a location "on the Camden and Amboy Railroad, about eight miles (13 km) beyond South Amboy" or "about seven miles (11 km) from South Amboy" goes back, however, to at least 1853. Initially, the township was made up of farms and the population grew slowly. In 1880, the population was 1,662 and in 1950 it had reached 7,365. Over the next decade, a building boom started and farms gave way to developments, and the population grew to 22,772 by 1960. The 1980 census cited 51,406 people. The township saw major changes with the extension of Route 18 to the shore. The first inhabitants of the area known as Old Bridge, were the Lenni Lenape Native Americans. Those who settled in Old Bridge were known as the Unami, or "people down the river." They, like many people today, migrated to the shore along the Raritan each summer from their hunting grounds in the north. When the English gained control from the Dutch in 1664, the state was divided into two provinces, East Jersey and West Jersey. In 1683, the general assembly of East Jersey defined the boundaries of Middlesex County and the three other original counties (Bergen, Essex and Monmouth) as containing all plantations on both sides of the Raritan River, as far as Cheesequake Harbor to the east, then southwest to the Provincial line, with the southwest line being the border of Monmouth and Middlesex Counties and the Township's southern border. Thomas Warne, one of the original 24 proprietors of East Jersey, was listed as a landowner of this area, and his son is said to have been the earliest white resident residing in the Cheesequake area in 1683. John and Susannah Brown were granted a 1,000 acres (4.0 km2) land grant from the King of England in 1737. They called the area Brownville, and today this part of town is now known as Browntown. In 1684, South Amboy Township was formed. At that time, it covered an area that now consists of the Townships of Monroe and Old Bridge, the Borough of Sayreville and the City of South Amboy. The Township covers 42 square miles (110 km2) that separated from South Amboy on March 2, 1869, and was originally called Madison Township. In 1975, the name was changed by referendum to the Township of Old Bridge. The purpose of doing this was to formulate just one postal designations and ZIP code for the township and to differentiate the township from the Borough of Madison in Morris County. Old Bridge derives its name from the fact that the first bridge spanning the South River was built there, and as other bridges were built across the river the first one became known as "the Old Bridge." Prior to that, it was known as South River Bridge." According to the United States Census Bureau, the township had a total area of 40.783 square miles (105.627 km2), including 38.060 square miles (98.575 km2) of land and 2.723 square miles (7.052 km2) of water (6.68%). Brownville (2010 population of 2,383), Laurence Harbor (2010 population of 6,536), Madison Park (2010 population of 7,144) and Old Bridge CDP (2010 population of 23,753) are unincorporated communities and census-designated places (CDPs) located within Old Bridge Township. Other unincorporated communities, localities and place names within Old Bridge Township include Browntown, Brunswick Gardens, Cheesequake, Cottrell Corners, East Spotswood, Matchaponix, Moerls Corner, Morristown, Parlin, Redshaw Corner, Runyon, Sayre Woods South, South Old Bridge and Texas. Madison Township had many mill streams that were used to generate water power. The Warne family owned fulling mills in the area. Fulling was used as a finishing process used on woolen cloth that would remove the dirt and grease and to compact the wool fibers. The mill is said to have been run behind Old Bridge High School and flows east into the Matawan Creek. The area of Old Bridge was also known for their numerous snuff mills. The Washington Snuff mill (later renamed the Dill Snuff Mill) was established in 1801 and was located on Mount Pleasant and Old Bridge Turnpike (now Route 516). Snuff is a scented tobacco product that was used by men and women during that time period. The clay soil in the area surrounding Old Bridge was used for pottery and bricks way before the first European settlers. "Fine clay had surrounded Cheesequake Creek when the Lenni Lenape Native Americans lived there. The early discoveries of clay along the banks opened the clay industry to Middlesex County as well as the state of New Jersey. By the 1800s clay was a major industry. 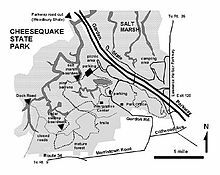 The clay deposits found along Cheesequake Creek are reported to be some of the finest stoneware clays in the United States." The clay supplied local potters as well as those in Hudson Valley, Norwalk, Connecticut, other New England states, and parts of Canada. The earliest use of clay from this area was used by Captain James Morgan before the Revolution. The Perrine clay pit was located near U.S. Route 9 and Ernston Road. The Cottrell homestead is a landmark in Old Bridge. It was built in 1831 and still stands today on the northeast corner of County Route 516 and Cottrell Road. The Cottrells owned a 150-acre (61 ha) apple orchard that was located across the street from their home. Apples that could not be used because of their size or quality did not go to waste. Across from the cold-storage building on the southwest corner of Cottrell Road and Route 516 (where Rite Aid is now located), the family built the New Jersey Apple Growers Inc. distillery. It was at this distillery that they pressed the apples into cider and distilled the brandy in large vats. The brandy would age in barrels in a government warehouse that was located on the Cottrells' property. The Cottrells produced apple brandy for twenty years on the farm and sold it wholesale to distributors under the name Browntown. As of the 2010 United States Census, there were 65,375 people, 23,777 households, and 17,333.433 families residing in the township. The population density was 1,717.7 per square mile (663.2/km2). There were 24,638 housing units at an average density of 647.3 per square mile (249.9/km2). The racial makeup of the township was 74.06% (48,418) White, 6.21% (4,063) Black or African American, 0.20% (129) Native American, 14.34% (9,374) Asian, 0.02% (10) Pacific Islander, 2.72% (1,780) from other races, and 2.45% (1,601) from two or more races. Hispanic or Latino of any race were 10.81% (7,064) of the population. There were 23,777 households out of which 33.7% had children under the age of 18 living with them, 58.5% were married couples living together, 10.1% had a female householder with no husband present, and 27.1% were non-families. 22.6% of all households were made up of individuals, and 7.9% had someone living alone who was 65 years of age or older. The average household size was 2.73 and the average family size was 3.25. In the township, the population was spread out with 22.8% under the age of 18, 7.8% from 18 to 24, 27.2% from 25 to 44, 30.1% from 45 to 64, and 12.1% who were 65 years of age or older. The median age was 40.1 years. For every 100 females there were 95.2 males. For every 100 females ages 18 and older there were 92.5 males. The Census Bureau's 2006-2010 American Community Survey showed that (in 2010 inflation-adjusted dollars) median household income was $82,640 (with a margin of error of +/- $6,053) and the median family income was $98,634 (+/- $2,857). Males had a median income of $67,487 (+/- $3,364) versus $48,856 (+/- $3,104) for females. The per capita income for the township was $35,666 (+/- $1,152). About 3.1% of families and 4.1% of the population were below the poverty line, including 4.3% of those under age 18 and 6.6% of those age 65 or over. As of the 2000 United States Census there were 60,456 people, 21,438 households, and 15,949 families residing in the township. The population density was 1,587.4 people per square mile (612.8/km²). There were 21,896 housing units at an average density of 574.9 per square mile (222.0/km²). The racial makeup of the township was 79.48% White, 10.82% Asian, 5.30% African American, 0.16% Native American, 0.04% Pacific Islander, 1.87% from other races and 2.32% from two or more races. 7.57% of the population were Hispanic or Latino of any race. There were 21,438 households out of which 37.8% had children under the age of 18 living with them, 61.2% were married couples living together, 9.5% had a female householder with no husband present, and 25.6% were non-families. 21.1% of all households were made up of individuals and 6.8% had someone living alone who was 65 years of age or older. The average household size was 2.80 and the average family size was 3.30. In the township the population was spread out with 25.9% under the age of 18, 7.0% from 18 to 24, 33.6% from 25 to 44, 22.9% from 45 to 64, and 10.5% who were 65 years of age or older. The median age was 36 years. For every 100 females, there were 95.6 males. For every 100 females age 18 and over, there were 91.7 males. The median income for a household in the township was $64,707, and the median income for a family was $74,045. Males had a median income of $51,978 versus $35,462 for females. The per capita income for the township was $26,814. About 3.0% of families and 4.2% of the population were below the poverty line, including 5.0% of those under age 18 and 7.2% of those age 65 or over. Old Bridge Township is governed within the Faulkner Act, formally known as the Optional Municipal Charter Law, under the Faulkner Act (Mayor-Council) system of municipal government. The Township Council consists of nine members, with six elected to represent wards and three elected at-large from the Township as a whole in partisan elections held as part of the November general election. All elected officials serve four-year terms of office on a staggered basis, with the six ward seats up for election together and the three at-large seats and the mayoral seat up for vote together two years later. As of 2016[update], the Mayor of Old Bridge Township is Republican Owen Henry, whose term of office ends December 31, 2019. The members of the Township Council are Council President Brian J. Cahill (R, 2019; At-Large), Council Vice-President Alan Rosencranz (R, 2017; Ward 4), June T. Dungee (D, 2017; Ward 3), Dr. Anita Greenberg-Belli (R, 2019; At-Large), Richard J. Greene (R, 2017; Ward 5), Joseph Mollis (R, 2017; Ward 1), Lucille Panos (R, 2017; Ward 6), Mary R. Sohor (R, 2017; Ward 2) and Eleanor "Debbie" Walker (R, 2019; At-Large). In June 2016, the Township Council appointed June Dungee to fill the vacant Third Ward seat expiring in December 2017 that had been held by Reginald Butler until his death earlier that month; Dungee will serve until the November 2016 general election, when voters will choose a candidate to serve the balance of the term of office. Old Bridge Township is split between the 6th and 12th Congressional Districts and is part of New Jersey's 12th state legislative district. Prior to the 2011 reapportionment following the 2010 Census, Old Bridge Township had been in the 13th state legislative district. 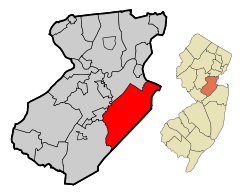 Prior to the 2010 Census, Old Bridge Township had also been split between the 6th and 12th Congressional Districts, though with different boundaries, a change made by the New Jersey Redistricting Commission that took effect in January 2013, based on the results of the November 2012 general elections. The split that took effect in 2013 placed 22,050 residents in the township's northern and eastern portions in the 6th District, while 43,325 residents in the western and southern area of the township were placed in the 12th District. For the 116th United States Congress, New Jersey's Sixth Congressional District is represented by Frank Pallone (D, Long Branch). For the 116th United States Congress, New Jersey's Twelfth Congressional District is represented by Bonnie Watson Coleman (D, Ewing Township). New Jersey is represented in the United States Senate by Democrats Cory Booker (Newark, term ends 2021) and Bob Menendez (Paramus, term ends 2025). As of March 23, 2011, there were a total of 38,907 registered voters in Old Bridge Township, of which 10,946 (28.1%) were registered as Democrats, 6,363 (16.4%) were registered as Republicans and 21,577 (55.5%) were registered as Unaffiliated. There were 21 voters registered to other parties. In the 2012 presidential election, Democrat Barack Obama received 54.1% of the vote (13,127 cast), ahead of Republican Mitt Romney with 44.9% (10,911 votes), and other candidates with 1.0% (240 votes), among the 24,402 ballots cast by the township's 39,947 registered voters (124 ballots were spoiled), for a turnout of 61.1%. In the 2008 presidential election, Democrat Barack Obama received 51.0% of the vote (14,001 cast), ahead of Republican John McCain with 47.4% (13,019 votes) and other candidates with 1.0% (274 votes), among the 27,464 ballots cast by the township's 39,454 registered voters, for a turnout of 69.6%. In the 2004 presidential election, Republican George W. Bush received 51.0% of the vote (12,722 ballots cast), outpolling Democrat John Kerry with 47.7% (11,884 votes) and other candidates with 0.7% (237 votes), among the 24,931 ballots cast by the township's 36,428 registered voters, for a turnout percentage of 68.4. In the 2013 gubernatorial election, Republican Chris Christie received 68.3% of the vote (10,211 cast), ahead of Democrat Barbara Buono with 30.3% (4,532 votes), and other candidates with 1.4% (206 votes), among the 15,147 ballots cast by the township's 40,437 registered voters (198 ballots were spoiled), for a turnout of 37.5%. In the 2009 gubernatorial election, Republican Chris Christie received 57.8% of the vote (9,511 ballots cast), ahead of Democrat Jon Corzine with 35.9% (5,898 votes), Independent Chris Daggett with 5.9% (976 votes) and other candidates with 1.0% (168 votes), among the 16,444 ballots cast by the township's 38,430 registered voters, yielding a 42.8% turnout. The Old Bridge Township Public Schools serve students in kindergarten through twelfth grade. As of the 2011-12 school year, the district's 15 schools had an enrollment of 9,197 students and 684.0 classroom teachers (on an FTE basis), for a student–teacher ratio of 13.45:1. Schools in the district (with 2011-12 enrollment data from the National Center for Education Statistics) are twelve K-5 elementary schools — M. Scott Carpenter Elementary School (278 students), Cheesequake Elementary School (302), Leroy Gordon Cooper Elementary School (262), Virgil I. Grissom Elementary School (231), Madison Park Elementary School (298), James A. McDivitt Elementary School (552), Memorial Elementary School (417), William A. Miller Elementary School (313), Walter M. Schirra Elementary School (332), Alan B. Shepard Elementary School (282), Southwood Elementary School (292) and Raymond E. Voorhees Elementary School (390) — both Jonas Salk Middle School (1,035) and Carl Sandburg Middle School (1,182) for grades 6-8 and Old Bridge High School for grades 9-12 (3,031). As of May 2010[update], the township had a total of 222.24 miles (357.66 km) of roadways, of which 179.32 miles (288.59 km) were maintained by the municipality, 24.41 miles (39.28 km) by Middlesex County and 16.65 miles (26.80 km) by the New Jersey Department of Transportation and 1.86 miles (2.99 km) by the New Jersey Turnpike Authority. The Garden State Parkway passes through Old Bridge for about 1.9 miles (3.1 km), connecting Aberdeen Township in Monmouth County in the south to Sayreville in the north and houses Interchange 120, which is signed for Laurence Harbor / Matawan. Other routes, such as U.S. 9, Route 18, Route 34 and Route 35 also pass through the township. Old Bridge Airport is located 5 miles (8.0 km) south of the central business district. Some major county routes that pass through are County Route 516, County Route 520, County Route 527 and County Route 615. The New Jersey Turnpike (Interstate 95) is minutes north along Route 18 outside the township in bordering East Brunswick Township (Exit 9) and not too far also in bordering Monroe Township (Exit 8A). Old Bridge borders Matawan on Route 34, and the Aberdeen-Matawan train station. Old Bridge Park and Ride is located along Route 9 northbound, close to Ernston Road. NJ Transit Bus Operations provides route 131, 133, 134, 135, 138, and 139 to the Port Authority Bus Terminal in Midtown Manhattan, service to Newark on the 67, on the 68 to Jersey City and local service on the 817 and 818 routes. Raritan Bay Medical Center has two hospitals in the area. Old Bridge division and Perth Amboy division. The Old Bridge Division is located at the intersection of Route 18 and Ferry Road. This hospital handles all but trauma cases. Most trauma cases are handled by Robert Wood Johnson University Hospital in close-by New Brunswick. Old Bridge also has many long term care facilities and nursing homes. Old Bridge maintains a full-time police department consisting of 90 sworn personnel divided into multiple bureaus. The police department handles approximately 50,000 to 55,000 calls for service each year. Administration Bureau: Chief of Police. Police radio, computer, 9-1-1, and dispatch operations. Training, scheduling etc. Patrol Bureau: First responders for calls of service, motor vehicle crash investigators, motor vehicle and criminal law enforcement, road construction, special operations. Traffic Safety Bureau: All traffic enforcement, road construction planning, commuter lot parking enforcement, state funded grants (i.e. :seatbelt enforcement, mobile phone enforcement, child seat, pedestrian etc.) serious and fatal motor vehicle crash investigations, large scale lane closings for events or crashes, road striping, traffic sign replacement and repair, ATV details, special events. Security of impounded vehicles. Detective Bureau: Investigates all serious offenses and crimes, serious and fatal motor vehicle crash investigations, plain clothes operations. Works closely with FBI, United States Secret Service, Alcoholic Beverage Control and other federal agencies. Identification Bureau: Works in conjunction with the detective bureau, documents all serious crime scenes, photography for crime scenes and fatal/serious motor vehicle crashes, fingerprinting, evidence collection, processing and storing, civilian background checks, Megans Law enforcement, firearms application investigating and processing. Narcotics Bureau: All drug- and alcohol-related investigations, undercover operations, surveillance, liaisons with Prosecutors office, special operations, raids. Keeps a close relationship with the DEA. Fire Arms Unit: Officers trained in qualifying and training all police personnel in weapons systems. This unit repairs and maintains firearms, gear and schedules all state mandated firearms training for the officers. Orders ammunition and supplies related to officer gear. Special Operations: Department of Homeland Security liaisons, Laurence Harbor and Cliffwood Beach boardwalk and beachfront details, anti-terrorism and counter-terrorism training, covert operations. Police Garage: Mechanics trained in police vehicle repair, wiring, maintenance, storage of impounded vehicles. Auxiliary Police: Patrol in marked cars and uniform. They augment the regular officers while on patrol. Auxiliary officers provide additional security for events and details, parade traffic assistance, township fairs, carnivals, benefit functions etc. These officers fall under the Office of Emergency Management section of the township and are all volunteers, receiving no paychecks for their services. Special police officers: Most of these "special" employees are classified as Class I officers. They provide security at parks and recreation areas, conduct crowd control and are frequently used on court days to handle prisoners. They also serve as another set of eyes and ears for the patrol bureau. Class II officers are also employed in the township. They do the same as the Class I officers, however, not many remain. Fire District 1: Laurence Harbor Fire Department, established in 1924 and operating out of two stations. Fire District 2: Cheesequake Volunteer Fire Company, with Station 1 at 113 Route 34, Station 2 at 4290 Route 516 and Station 3 at 3080 Route 516. Fire District 3: South Old Bridge Volunteer Fire Company, established in 1947 and operating out of three stations, with Engine Company 1 located at 958 Englishtown Road, Engine Company 2 at 14 Throckmorton Lane and Engine Company 3 at 1599 Englishtown Road. Fire District 4: Madison Park Volunteer Fire Company, organized in 1956. Old Bridge is divided into five districts each with a volunteer first aid squad. Numerous ambulances are in service for the community. A paid squad is employed between the hours of 6am to 6pm. Old Bridge Township Emergency Medical Services (OBTEMS) is an all-paid squad which is not affiliated with any of the five volunteer organizations or the Township itself. Advanced Life support or "ALS" for short, also known as medics, are paid personnel dispatched to all township calls based on the requirements of assistance. Medics respond to all life/death situations due to a traumatic injury, industrial accident, heart problems, strokes, serious vehicle crashes, etc. The medics are housed by Robert Wood Johnson University Hospital, Saint Peter's University Hospital and Raritan Bay Medical Center. Each are assigned their own ambulance. CPS Madison Industries Superfund Site has been identified as the 14th-worst Superfund site in the United States. That area is fenced off along Waterworks Road, near Cheesequake Road. This area has one chemical plant still operating, Old Bridge Chemical. A former plant, Ciba Chemical closed several years ago and a bulk of the plant was demolished, only the office building remains. Many small ponds in the area are remnants of clay pits dug in the 19th century, as clay was a major industry. The Perrine clay pit was located near Route 9 and Ernston Road. The Runyon coal yards were located off Bordentown Avenue and Cheesequake Road, where Stavola Asphalt Construction Company (formerly Manzos Contracting) currently operates. Rail cars at this yard were used to transport their loads to the South Amboy docks, where the coal was shipped to New York City. Pilings of former docks can be found by foot traversing Steamboat Landing Road, also known as Dock Road, which is the extension of Cottrell Road at its intersection with Route 34. The Ochwald Brickworks, now the site of Bridgepointe Development in Laurence Harbor, began operation in 1910 and continued operation into the early 1960s. Behind the Bridgepointe Development and far into the woodline and field, old bricks can still be found. The Kepec Chemical Company in the Genoa section (off County Road) is where Julius and Ethel Rosenberg allegedly contacted Russian spies in 1950. The FBI conducted surveillance of the building at the corner of Biondi Avenue and Gordon Street. Only a few bricks remain to mark this location at the foot of Columbus Avenue. A mass grave in the Ernst Memorial Cemetery off Ernston Road holds the remains of over a dozen unidentified victims of the T. A. Gillespie Company Shell Loading Plant explosion of 1918. This plant exploded in the Morgan section of neighboring Sayreville, killing an estimated 100 persons. Shock waves were felt as far north as Newark. A circular car racing track (early 1950s to approximately 1982) used to be located off County Route 516 where the Whispering Pines Development is now. No visible trace remains. Cheesequake State Park, one of the oldest in the country, opening on June 22, 1940, covers 1,274 acres (516 ha), partially located in Old Bridge. Located near the Garden State Parkway exit 120, Route 34 and Route 35, the park is often crowded by sunbathers, picnics, concert goers (nearby PNC Bank Arts Center) and tourists. A Cold War-era Nike missile base is located off U.S. Route 9 on Jake Brown Road. Listed in Weird NJ as a haunted site, readers frequent this area and explore the fields where former base worker residences once stood. The actual base was purchased by Old Bridge Township Board of Education and is currently used to store their own supplies and vehicles. The former underground silos and tunnels were purposely flooded and caved in when the base was closed. Old Bridge Township Raceway Park, a racetrack that had hosted Funny Car and drag racing including the NHRA Summernationals, is located off Route 527 (Englishtown Road) near the township's border with Manalapan and Monroe. As part of a January 2018 reorganization, the facility announced that it will no longer be holding drag racing events, retaining kart and motocross races, as well as car shows and concerts. See also: Category:People from Old Bridge Township, New Jersey. Brandon Allen (born 1993), professional soccer player for the New York Red Bulls. R. J. Allen (born 1990), professional soccer player for New York City FC. Josh Ansley, bass player for Streetlight Manifesto and Catch 22. T. Frank Appleby (1864–1924), represented New Jersey's 3rd congressional district in the United States House of Representatives from 1921 to 1923. George Brasno (1911-1982) and Olive Brasno (1917-1998), vaudevillian performers known for their roles in the Our Gang comedies and Charlie Chan movie series, who turned down an offer to appear as Munchkins in The Wizard of Oz. Adam Chazen (born 1985/86), special effects producer, best known for his work on the cable television series Game of Thrones, for which he has received five Emmy Awards. Louis Consalvo (born 1958), reputed soldier in the DeCavalcante crime family. Junot Diaz (born 1968), Pulitzer Prize-winning novelist. Colleen Fitzpatrick (born 1969), a pop music artist, dancer and actress, better known by her stage name, Vitamin C.
Minkah Fitzpatrick (born 1996), American football defensive back for the Miami Dolphins. Laurie Hernandez (born 2000), artistic gymnast representing Team USA at the 2016 Summer Olympics. Gold medalist in the team competition. Phil Ivey (born 1977), professional poker player. Franklin Lawson, retired soccer player who played professionally in the American Soccer League and the United Soccer League. Caren Lissner (born 1972), novelist. Fabian Nicieza (born 1961), comic book writer and editor who is best known for his work on Marvel titles such as X-Men, X-Force, New Warriors, Cable & Deadpool and Thunderbolts. Brian O'Halloran (born 1969), actor. Appeared in Clerks and Clerks 2. Jodi Lyn O'Keefe (born 1978), actress. Metallica heavy metal band (formed 1981). Tab Ramos (born 1966), retired soccer midfielder. George Rizzi (born 1951), guitarist and musical director of the 1960s pop/rock group The Happenings, whose hits include "See You In September" and "Go Away Little Girl". Michael Rotkowitz (born 1974), applied mathematician best known for his work in decentralized control theory..
Ed Sanicki (1923–1998), outfielder who played for the Philadelphia Phillies. Donna Simpson (born 1967), Guinness World Record holder for largest mother. Shannon Sohn (born 1974), first helicopter reporter to earn a national Emmy Award. William H. Sutphin (1887–1972) represented New Jersey's 3rd congressional district from 1931-1943. ^ 2017 New Jersey Mayors Directory, New Jersey Department of Community Affairs. Accessed May 30, 2017. As of date accessed, Henry is listed as mayor with an incorrect term-end year of 2020. ^ Administration; Staff Directory, Old Bridge Township. Accessed July 13, 2016. ^ Township Clerk; Staff Directory, Old Bridge Township. Accessed July 13, 2016. ^ U.S. Geological Survey Geographic Names Information System: Township of Old Bridge, Geographic Names Information System. Accessed March 8, 2013. ^ a b c d e f DP-1 - Profile of General Population and Housing Characteristics: 2010 for Old Bridge township, Middlesex County, New Jersey, United States Census Bureau. Accessed March 11, 2012. ^ a b c Profile of General Demographic Characteristics: 2010 for Old Bridge township, New Jersey Archived 2014-08-03 at the Wayback Machine, New Jersey Department of Labor and Workforce Development. Accessed March 11, 2012. ^ a b PEPANNRES - Annual Estimates of the Resident Population: April 1, 2010 to July 1, 2017 - 2017 Population Estimates for New Jersey municipalities, United States Census Bureau. Accessed June 25, 2018. ^ Look Up a ZIP Code for Old Bridge, NJ, United States Postal Service. Accessed March 11, 2012. ^ Look Up a ZIP Code for Parlin, NJ, United States Postal Service. Accessed March 11, 2012. ^ Look Up a ZIP Code for Laurence Harbor, NJ, United States Postal Service. Accessed March 11, 2012. ^ Look Up a ZIP Code for Cliffwood, NJ, United States Postal Service. Accessed March 11, 2012. ^ Area Code Lookup - NPA NXX for Old Bridge, NJ, Area-Codes.com. Accessed September 23, 2014. ^ Table 7. Population for the Counties and Municipalities in New Jersey: 1990, 2000 and 2010 Archived 2013-05-20 at the Wayback Machine, New Jersey Department of Labor and Workforce Development, February 2011. Accessed November 25, 2012. ^ The Counties and Most Populous Cities and Townships in 2010 in New Jersey: 2000 and 2010 Archived 2011-02-21 at the Wayback Machine, United States Census Bureau. Accessed March 11, 2012. ^ Mulvihill, Geoff; and Cortez, Julio. "Official: 3 dead in NJ supermarket shooting"." Houston Chronicle, from the Denver Post, August 31, 2012. Accessed August 31, 2012. "Old Bridge is a bedroom suburb of about 23,000 about 25 miles from Manhattan but just across the Raritan Bay from Staten Island." ^ Ariosto, David. "Gunman kills two, then himself, at New Jersey supermarket, authorities say." CNN. August 31, 2012. Accessed August 31, 2012. ^ Snyder, John P. The Story of New Jersey's Civil Boundaries: 1606-1968, Bureau of Geology and Topography; Trenton, New Jersey; 1969. p. 170. Accessed March 11, 2012. ^ a b c History Archived 2012-02-03 at the Wayback Machine, Old Bridge Township. Accessed January 30, 2012. ^ Cheslow, Jerry. "If You're Thinking of Living in: Old Bridge", The New York Times, April 21, 1991. Accessed March 11, 2012. ^ Staff. "Another Railroad Tragedy. ; Collision on the Camden and Amboy Railroad. Five Persons Killed---Others Dying,---Twenty or Thirty Injured. Indignation Meeting of the Passengers--Speeches and Resolutions. Particulars from an Eye-Witness. Other Accounts by Various Passengers given to our Reporters. Another Account. Meeting of the Passengers--Speeches, Resolutions, &c., delivered and drawn up at the Scene of the Calamity. Another Railroad Tragedy. By Telegraph. ", The New York Times, August 10, 1853. Accessed January 30, 2012. ^ MONEY Magazine Best places to live 2007, Money (magazine). ^ Best Places to Live 2005, Money (magazine). ^ De Angelo, Walter A. History Buff's: The Hitchhiker's Guide to Middlesex County Archived 2012-07-22 at the Wayback Machine, Middlesex County, New Jersey. Accessed June 15, 2012. "On March 7, 1683, the Assembly of East Jersey established four counties, Middlesex, Bergen, Essex and Monmouth. Middlesex County's original boundaries ran from the Essex County line eastward as far as Cheesequake Harbour, then southwest to the boundary between the provinces of East and West Jersey, and then northwest to the provincial boundary of East Jersey." ^ Snyder, John P. The Story of New Jersey's Civil Boundaries: 1606-1968, Bureau of Geology and Topography; Trenton, New Jersey; 1969. p. 165. Accessed October 23, 2012. ^ a b c d e Launay, Michael J. Images of America: Old Bridge. Charleston, SC. Arcadia Publishing, 2002. ISBN 9780738509921. Accessed January 18, 2018. ^ Cheslow, Jerry. "If You're Thinking of Living In/Old Bridge Township, N.J.; Fast Growing, but With a Rural Ambience", The New York Times, February 20, 2000. Accessed March 11, 2012. ^ History of East Brunswick Archived 2011-12-06 at the Wayback Machine, East Brunswick Historical Society. Accessed January 30, 2012. ^ DP-1 - Profile of General Population and Housing Characteristics: 2010 Demographic Profile Data for Brownville CDP, Middlesex County, New Jersey, United States Census Bureau. Accessed June 15, 2012. ^ DP-1 - Profile of General Population and Housing Characteristics: 2010 Demographic Profile Data for Laurence Harbor CDP, Middlesex County, New Jersey, United States Census Bureau. Accessed June 15, 2012. ^ DP-1 - Profile of General Population and Housing Characteristics: 2010 Demographic Profile Data for Madison Park CDP, Middlesex County, New Jersey, United States Census Bureau. Accessed June 15, 2012. ^ DP-1 - Profile of General Population and Housing Characteristics: 2010 Demographic Profile Data for Old Bridge CDP, Middlesex County, New Jersey, United States Census Bureau. Accessed June 15, 2012. ^ New Jersey: 2010 - Population and Housing Unit Counts - 2010 Census of Population and Housing (CPH-2-32), United States Census Bureau, August 2012. Accessed November 25, 2012. ^ GCT-PH1 - Population, Housing Units, Area, and Density: 2010 - County -- County Subdivision and Place from the 2010 Census Summary File 1 for Middlesex County, New Jersey, United States Census Bureau. Accessed November 25, 2012. ^ Locality Search, State of New Jersey. Accessed April 8, 2015. ^ Areas touching Old Bridge Township, MapIt. Accessed June 30, 2015. ^ a b Disbrow Martin, Alvia. At the Headwaters of Cheesequake Creek. South Amboy: Madison Township Historical Society, 1979. ^ Raum, John O. The History of New Jersey: From Its Earliest Settlement to the Present Time, Volume 1, p. 246, J. E. Potter and company, 1877. Accessed August 6, 2013. "Madison was formed from South Amboy township in 1869, and in 1870 had a population of 1,634. Jacksonville is at the head of Cheesquake creek." ^ Thirteenth Census of the United States, 1910: Population by Counties and Minor Civil Divisions, 1910, 1900, 1890, United States Census Bureau, p. 337. Accessed May 11, 2012. ^ Fifteenth Census of the United States : 1930 - Population Volume I, United States Census Bureau, p. 717. Accessed March 11, 2012. ^ a b c d e Census 2000 Profiles of Demographic / Social / Economic / Housing Characteristics for Old Bridge township, Middlesex County, New Jersey Archived 2014-07-14 at the Wayback Machine, United States Census Bureau. Accessed July 15, 2013. ^ a b c d e DP-1: Profile of General Demographic Characteristics: 2000 - Census 2000 Summary File 1 (SF 1) 100-Percent Data for Old Bridge township, Middlesex County, New Jersey, United States Census Bureau. Accessed July 15, 2013. ^ DP03: Selected Economic Characteristics from the 2006-2010 American Community Survey 5-Year Estimates for Old Bridge township, Middlesex County, New Jersey, United States Census Bureau. Accessed March 11, 2012. ^ Form of Government, Old Bridge Township. Accessed July 13, 2016. ^ Office of the Mayor, Old Bridge Township. Accessed July 13, 2016. ^ Township Council, Old Bridge Township. Accessed July 13, 2016. ^ 2016 Municipal User Friendly Budget, Old Bridge Township. Accessed July 13, 2016. ^ Township of Old Bridge, Middlesex County, New Jersey. Accessed July 12, 2016. ^ Epstein, Sue. "The Old Bridge council has chosen a replacement for Reginald Butler", NJ Advance Media for NJ.com, June 28, 2016. Accessed July 13, 2016. "The council chose a replacement Monday night for long-time councilman Reginald Butler, who died earlier this month after a lengthy illness. June Dungee, 72, will represent Ward 3 until November when there will be a special election to choose someone to fill out the remaining year left on Butler's term." ^ a b 2011 New Jersey Citizen's Guide to Government Archived 2013-06-04 at the Wayback Machine, p. 62, New Jersey League of Women Voters. Accessed May 22, 2015. 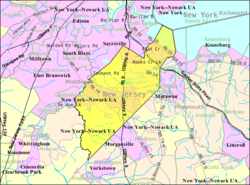 ^ New Jersey Congressional Districts 2012 - 2021: Old Bridge, New Jersey Redistricting Commission, December 23, 2011. Accessed January 6, 2013. ^ District information for Old Bridge Township School District, National Center for Education Statistics. Accessed September 23, 2014. ^ School Data for the Old Bridge Township Public Schools, National Center for Education Statistics. Accessed September 23, 2014. ^ M. Scott Carpenter Elementary School, Old Bridge Township Public Schools. Accessed August 6, 2013. ^ Cheesequake Elementary School, Old Bridge Township Public Schools. Accessed August 6, 2013. ^ Leroy Gordon Cooper Elementary School, Old Bridge Township Public Schools. Accessed August 6, 2013. ^ Virgil I. Grissom Elementary School, Old Bridge Township Public Schools. Accessed August 6, 2013. ^ Madison Park Elementary School, Old Bridge Township Public Schools. Accessed August 6, 2013. ^ James A. McDivitt Elementary School, Old Bridge Township Public Schools. Accessed August 6, 2013. ^ Memorial Elementary School, Old Bridge Township Public Schools. Accessed August 6, 2013. ^ William A. Miller Elementary School, Old Bridge Township Public Schools. Accessed August 6, 2013. ^ Walter M. Schirra Elementary School, Old Bridge Township Public Schools. Accessed August 6, 2013. ^ Alan B. Shepard Elementary School, Old Bridge Township Public Schools. Accessed August 6, 2013. ^ Southwood Elementary School, Old Bridge Township Public Schools. Accessed August 6, 2013. ^ Raymond E. Voorhees Elementary School Archived 2011-08-09 at the Wayback Machine, Old Bridge Township Public Schools. Accessed August 6, 2013. ^ Jonas Salk Middle School Archived 2011-12-24 at the Wayback Machine, Old Bridge Township Public Schools. Accessed August 6, 2013. ^ Carl Sandburg Middle School Archived 2011-12-28 at the Wayback Machine, Old Bridge Township Public Schools. Accessed August 6, 2013. ^ Old Bridge High School Archived 2010-08-22 at the Wayback Machine, Old Bridge Township Public Schools. Accessed August 6, 2013. ^ Schools Archived 2013-10-28 at the Wayback Machine, Old Bridge Township Public Schools. Accessed August 6, 2013. ^ New Jersey School Directory for the Old Bridge Township Public Schools, New Jersey Department of Education. Accessed December 29, 2016. ^ Garden State Parkway Straight Line Diagram, New Jersey Department of Transportation, January 1997. Accessed September 23, 2014. ^ Travel Resources: Interchanges, Service Areas & Commuter Lots, New Jersey Turnpike Authority. Accessed September 23, 2014. ^ Middlesex County Bus / Rail Connections, backed up by the Internet Archive as of May 22, 2009. Accessed December 28, 2011. ^ Police Department Archived 2013-03-01 at the Wayback Machine, Old Bridge Township. Accessed January 30, 2012. ^ About Us, Cheesequake Volunteer Fire Company. Accessed June 15, 2012. ^ History, Laurence Harbor Fire Department. Accessed June 15, 2012. ^ Home Page, Cheesequake Volunteer Fire Company. Accessed June 15, 2012. ^ Department History, South Old Bridge Volunteer Fire Company. Accessed June 15, 2012. ^ Stations, South Old Bridge Volunteer Fire Company. Accessed June 15, 2012. ^ About Us, Madison Park Volunteer Fire Company. Accessed September 23, 2014. ^ Home page, Cheesequake Volunteer First Aid Squad. Accessed September 23, 2014. ^ About Us, Laurence Harbor Volunteer First Aid Squad. Accessed September 23, 2014. ^ Home page Archived 2015-10-02 at the Wayback Machine, Madison Park Volunteer First Aid Squad. Accessed September 23, 2014. ^ Home page, Old Bridge First Aid and Rescue Squad. Accessed September 23, 2014. ^ Home Page, Old Bridge Volunteer Emergency Medical Services. Accessed September 23, 2014. ^ Home page, Old Bridge Township Emergency Medical Services. Accessed June 15, 2012. ^ "John Piccolo Arena". RinkAtlas. Retrieved 29 January 2018. ^ Old Bridge Parks & Facilities, Old Bridge Township. Accessed November 11, 2015. ^ Other Names (Aliases) for CPS/Madison Industries, United States Environmental Protection Agency. Accessed August 10, 2015. ^ Donahue, Brian. "A town’s history as seen through the camera’s eye", Suburban News, June 6, 2002. Accessed January 18, 2018. "There are also the Runyan Coal Yards off Browntown Avenue, the old Cheesequake Hotel and even a picture of the Kepec Chemical Co. — the site where the Rosenbergs allegedly contacted Russian spies in 1950." ^ Grave Site of the Morgan Plant Unidentified Dead, Morgan, New Jersey. Accessed August 10, 2015. "The remains of those unfortunate souls, who were so badly disintegrated by the blasts, were buried in a mass grave in nearby Ernst Memorial Cemetery." ^ "Cheesequake State Park Offers Much To Do In A Small Package", New Jersey Department of Environmental Protection. Accessed January 18, 2018. "And while the serenity of Cheesequake Creek kayak ecotours are certainly a highlight of this 1,274-acre park in Old Bridge, Middlesex County, the added fishing, hiking and camping available among the coastal wetlands and forests also make for quality and sometimes surprising getaways in the well-developed Raritan Bay region." ^ Musco, Penny. "Jersey's Nukes; Where Nike missiles once reigned, tourists now roam. ", New Jersey Monthly, September 13, 2010. Accessed August 10, 2015. "Bender escorted me to two other Nike sites, part of the semicircle of nine northern New Jersey sites arranged around New York City. Off Route 9 in Old Bridge, the buildings are used by the Board of Education for bus maintenance." ^ via Associated Press. "Summernationals homeless after Raceway Park drops drag racing", ESPN, January 18, 2018. Accessed January 18, 2018. "The NHRA Summernationals no longer have a home. The owners of Raceway Park in Englishtown, New Jersey, have informed the National Hot Rod Association they no longer will host drag racing events, effective immediately.... While drag racing on the quarter-mile or eighth-mile track will end immediately, Raceway Park will use the stadium portion of the facility to continue most of its operations, including auto swap meets, numerous car shows, motocross and kart races and other events." ^ Staff. "New York Red Bulls sign Brandon Allen, Derrick Etienne as Homegrown Players, now lead MLS with 7 HGPs", Major League Soccer, December 21, 2015. Accessed July 2, 2016. "Allen, from Old Bridge, New Jersey, was a four-year starter at Georgetown, where he scored at least 10 goals each season and broke the school record for goals by netting his 50th earlier this year in the NCAA tournament." ^ Schnitzer, Kyle. "RJ Allen's sudden rise from youth coach to NYCFC underdog hero", New York Post, May 22, 2015. Accessed July 2, 2016. "Allen is a native of Old Bridge, NJ, who was named to the All-American second team in college at Monmouth." ^ Staff. "Hurt so good", Home News Tribune, March 14, 2008. Accessed February 7, 2011. "Spatola and Ansley (bass) both grew up in Old Bridge and went to shows and performed at the former Birch Hill Night Club in the township..."
^ Theodore Frank Appleby, Biographical Directory of the United States Congress. Accessed August 30, 2007. ^ Kemp, Heather Wendt for Weird NJ. "Weird NJ: The Brasnos – Old Bridge’s movie heroes", Asbury Park Press, April 23, 2017. Accessed December 26, 2017. Persons short in stature historically have found work in the entertainment industry. The members of the Brasno family of Old Bridge were able to benefit from this trend. They were a family of six, four of whom were little people. As 'proportional' dwarfs, or 'midgets' as they were commonly known in the 1930s, siblings Olive and George Brasno were offered Munchkin roles in The Wizard of Oz.... Not foreseeing that the movie would become a classic, Olive and George declined MGM’s offer, choosing instead to continue with their own more lucrative vaudeville act, 'Buster Shaver, Olive and George.'" ^ Santoriello, Angela. "Old Bridge native wins Emmy for outstanding visual effects Now a resident of Ireland, Adam Chazen earned award for HBO’s Game of Thrones, News Transcript, October 3, 2012. Accessed June 4, 2018. "Old Bridge High School graduate Adam Chazen shares his Emmy award with his mom, Michele. Adam Chazen has an eye for the unusual. That is why the Old Bridge, Middlesex County, native was handed the Outstanding Special Visual Effects award at the 2012 Creative Arts Emmys for his work on HBO’s Game of Thrones." ^ Press Release, United States Attorney for the Southern District of New York, October 19, 2000. Accessed February 7, 2011. ^ Tejada, Miguel Cruz. "Junot Díaz dice 'en RD hay muchos quirinos'; escribirá obra inspirada en caso" Archived 2008-08-22 at the Wayback Machine, El Nuevo Diario (Dominican Republic), August 11, 2008. Accessed August 25, 2008. "Hizo el bachillerato en el Cedar Ridge High School de Old Bridge, Nueva Jersey, en 1987, y se licenció en inglés en la Universidad Rutgers (1992), e hizo un Master of Fine Arts en la Universidad de Cornell." ^ "Off The Record: A Fine New Jersey 'Colleen'", Irish Voice, May 1, 2001. Accessed August 10, 2007. "Colleen Fitzpatrick, a comely lass from Old Bridge, New Jersey, is the media dynamo behind the concept known as Vitamin C."
^ Bernstein, Jason. "College Football National Championship: St. Peter's alum Minkah Fitzpatrick turning heads at Alabama", The Jersey Journal, January 8, 2016. Accessed July 26, 2016. "It didn't take long in Minkah Fitzpatrick's freshman year at St. Peter's Prep for coach Rich Hansen to see that he had a special talent on his hands.... Since then, Fitzpatrick, an Old Bridge native, has had a special freshman season for the Crimson Tide." ^ Epstein, Sue; and Mishkin, Kate. "N.J. town celebrates its new Olympian, gymnast Laurie Hernandez", NJ Advance Media for NJ.com, July 11, 2016. Accessed July 12, 2016. "Old Bridge — Laurie Hernandez, who won a spot on the U.S. Olympic gymnastics team Sunday night, is the talk of her hometown." ^ "Phil Ivey, High School Hall of Famer", F5 Poker. Accessed August 7, 2014. "Ivey went to the bulk of high school in Edison, New Jersey and eventually graduated from Middlesex's Old Bridge High School in 1995." ^ GPC Jaguar Women's Soccer: Coaches, Georgia Perimeter College. Accessed November 7, 2017. "Franklin Lawson enters his tenth year as assistant coach of Georgia Perimeter College women's soccer program. A native of New Jersey, Lawson was a second team All-State player at Cedar Ridge High School in Old Bridge, New Jersey." ^ Celano, Claire Marie. "Young author offers tips to audience at workshop: Caren Lissner says love of writing should be first ingredient toward success" Archived 2006-03-26 at the Wayback Machine, News Transcript, July 30, 2003. Accessed August 25, 2008. "Lissner, 31, grew up in Freehold Township and attended the Laura Donovan School and the Barkalow Middle School.... She later graduated from high school in Old Bridge." ^ O'Donnell, Chris. "Creator of weekend box office champion 'Deadpool' from NJ", Courier News, January 14, 2016. Accessed July 26, 2018. "He set his sights on being a comic book writer after the family moved to Old Bridge and he graduated from now defunct Madison Central High School in 1979." ^ Cahillane, Kevin. "For the Stars of Clerks, It's Take Two", The New York Times, July 14, 2006. Accessed June 8, 2008. "Mr. O'Halloran, a resident of Old Bridge since age 13, has not had to go the McJob route." ^ "Jodi Lyn O'Keefe about Hallmark Movie Class", Official Site Jodi Lyn O'Keefe. Accessed November 6, 2010. ^ "Metallica and the Old Bridge Metal Militia: The untold story ", Asbury Park Press, April 1, 2016. Accessed April 2, 2016. "... the couple decided to invite Metallica out to Old Bridge to record the songs on the demo for a proper album, which would eventually be called "Kill 'Em All." The band, originally from Los Angeles, subsequently lived in various houses and motels throughout Central Jersey and the Jersey Shore for the next two years when not on tour." ^ Mifflin, Lawrie. "Doing a Star Turn for the Home Team, at Last", The New York Times, August 18, 1996. Accessed March 11, 2012. "Giants Stadium is a short trip up the turnpike from Old Bridge, where Mr. Ramos lives with his wife, Amy -- a former North Carolina State University soccer player like her husband -- and their 16-month-old son, Alex." ^ Galdden, Michelle. "Show benefits those with ALS, other illnesses", Asbury Park Press, May 7, 2005. Accessed November 3, 2012, "'The idea is that the money is not earmarked just for research,' said George Rizzi of Old Bridge and a member of The Happenings." ^ Rotkowitz, Michael; and Lall, Sanjay. "A Characterization of Convex Problems in Decentralized Control", IEEE Transactions on Automatic Control, Vol. 51, No. 2, February 2006. Accessed June 1, 2018. "Michael Rotkowitz was born in Brooklyn, NY, in 1974, and was raised in Old Bridge, NJ." ^ Singerman, Philip. "Field Of Dreams This Baseball Season, These Three Men Share Life In The Minor Leagues. But Their Sights Are Set Higher:Two In The Future, One In The Past. ", Orlando Sentinel, August 11, 1985. Accessed February 15, 2011. "It's always that way for Oujo, 26, a native of Old Bridge N.J. now in his fifth season as a professional umpire... His next door neighbor Ed Sanicki a former major-league player with the Philadelphia Phillies told him that umpiring Little League games would be a much better way to earn extra money than working in a McDonald's..."
^ Rose, Lisa. "Once 600 pounds, mom from Old Bridge puts down the fork and turns off the webcam", The Star-Ledger, December 18, 2011. Accessed January 30, 2012. "A mother of two from Old Bridge became a tabloid phenomenon last year after saying she was proud of her 600-pound physique, and wouldn't mind getting bigger. Donna Simpson capitalized on the notoriety that followed, as her internet modeling career took off and traffic increased on her website, where voyeurs could watch her eat on camera for $19 a month." ^ Smith, Jessica. "TV news reporter recalls how her career took off: OBHS grad became first helicopter reporter to win national Emmy", Old Bridge Suburban, July 3, 2008. Accessed February 7, 2011. "Old Bridge - Though Emmy Award-winning television reporter Shannon Sohn always has a 'Plan B' in case things do not go her way, everything seems to have fallen into place quite nicely for her." Wikimedia Commons has media related to Old Bridge Township, New Jersey.